What do you think about your pastor? Do you chew over his sermons and wonder if they are clear and helpful? Do you feel he spends enough time with you? In fact, do you ever catch yourself wondering what he does all day? The truth is, often we think, "What can my pastor do for me?" Far less often do we think, "What can I do for my pastor?" Seasoned former pastor, Christopher Ash, urges church members to think about pastors not just in terms of what they do – how they lead and pray and preach and teach and so on – but about who they are. He encourages us to remember that pastors are people and to pray for them as they serve us. Paradoxically, caring for our pastor will be a blessing to us as well as to them, and create a culture of true fellowship in our church family. Why look after your pastor? Somebody needs to really know your pastor! 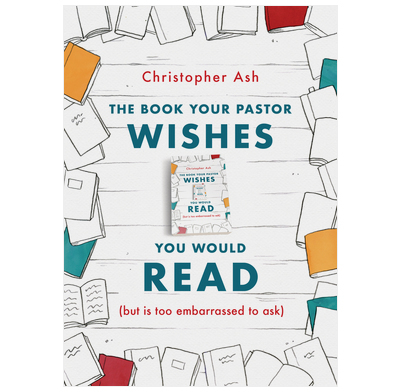 I was delighted that Christopher Ash’s new book unpacks the overlooked exhortation of Hebrews 13 v 17, namely, that it is the responsibility of the sheep to make the shepherd's work a joy and not a burden. Christopher lays out seven ways to do so. I know of no other book like this—it is a "charge to the congregation" that is more specific and practical than anything else you will find in print. Too many pastors today are discouraged, isolated, and weary, and it shows in the alarming rate of drop-out from pastoral ministry. In this book, Christopher Ash has pooled his extensive experience and wisdom to produce a book that could help make a real difference. If church members and leadership teams can read this book, we could help more pastors persevere and thrive in their ministry to us. Christopher Ash has served churches well for decades now, at Cornhill, in a local church, through his writings (how about that Job commentary?!). Now he provides a most unusual service. A modern take on an old form—the Church Member's Handbook—Christopher has asked the simple question, "How can I love and serve my pastor, in a way that will do him, his family and our church good?" The answer is straightforward, biblical and life-giving. Careful and loving, this in fact IS a book your pastor wishes you would read (but we ARE too embarrassed to ask you). Thanks, Christopher!